The CCSS Standards for Mathematical Practice are meant to be used throughout the year, applied to all lessons and skills practices. The wording is pretty dense and unapproachable, certainly not child friendly and possibly not even teacher friendly. There have been attempts at translation, but the examples I’ve seen still tend to be somewhat dry. Here’s my attempt, with a Grade 3 focus and a Waldorf lens. The CCSS standards are in blue, followed by their ambient counterparts. In third grade, mathematically proficient students know that doing mathematics involves solving problems and discussing how they solved them. Students explain to themselves the meaning of a problem and look for ways to solve it. Third grade students may use concrete objects or pictures to help them conceptualize and solve problems. They may check their thinking by asking themselves, “Does this make sense?” Students listen to other students’ strategies and are able to make connections between various methods for a given problem. Math is the underpinning of all life. By nature it likes to remain hidden, as a mystery that’s all the more compelling when discovered. Children understand this intrinsically, much more than we as adults do, with our more empirical mindsets. From this perspective, math in a Waldorf third grade takes a back seat to the rich tapestry of projects and activities that fill each day. But from that back seat, it presents itself beautifully as the universal bottom line. The meaning of a problem may be expressed through any practical examples such as small building projects, knitting patterns, recipes, etc. Discussing how a problem was solved takes a back seat to the finished product, which was accomplished together. The summary happens nicely when all steps of the project are colorfully written and illustrated in the students’ main lesson books. Here’s a page from a Waldorf Stone Bridge School measurement main lesson book. Mathematically proficient third grade students should recognize that a number represents a specific quantity. They connect the quantity to written symbols and create a logical representation of the problem at hand, considering both the appropriate units involved and the meaning of quantities. A Waldorf third grade student would have mastered this concept in first grade. Math By Hand introduces the Roman and then the Arabic numerals in depth, in the first Grade 1 math block. The abstract nature of the numbers we use is circumvented by the imaginative, pictorial, and historical treatment of the numbers as symbols. The Math By Hand Grade 2 place value block teaches the meaning of 1’s, 10’s, 100’s, and 1,000’s and their relationship to each other, in depth. 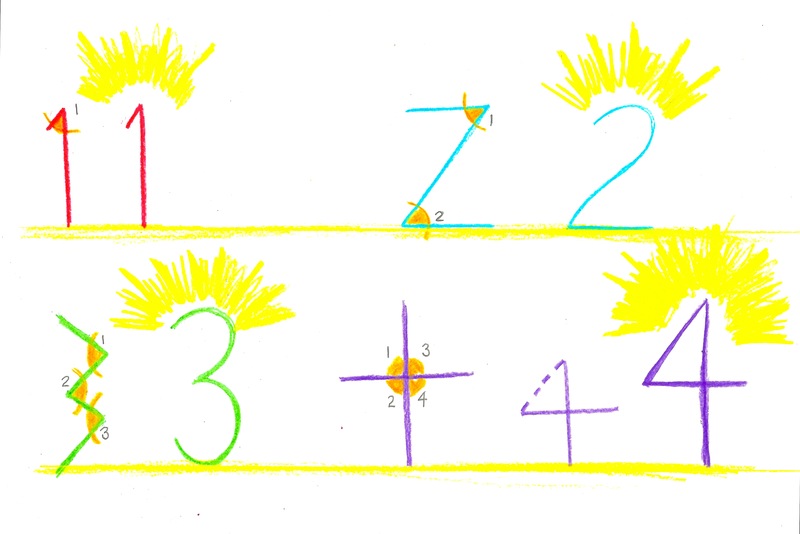 Here is an example from Math By Hand: the evolution of the Arabic numerals 1-4. 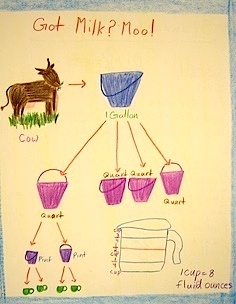 In third grade, mathematically proficient students may construct arguments using concrete referents, such as objects, pictures, and drawings. They refine their mathematical communication skills as they participate in mathematical discussions that the teacher facilities by asking questions such as “How did you get that?” and “Why is that true?” They explain their thinking to others and respond to others’ thinking. A third grade group building project is a most ideal application here. Students literally construct arguments by working together and combining ideas and solutions as the project proceeds. Having seen Common Core videos of classroom scenarios where this is put into practice, the teacher asking the questions listed above often takes on an artificial tone. If however, the explanation of and responses to thinking occur in a group context, i.e., through the modification of building techniques, measurements, and specifications, the resulting teaching and learning is much more effective and successful. 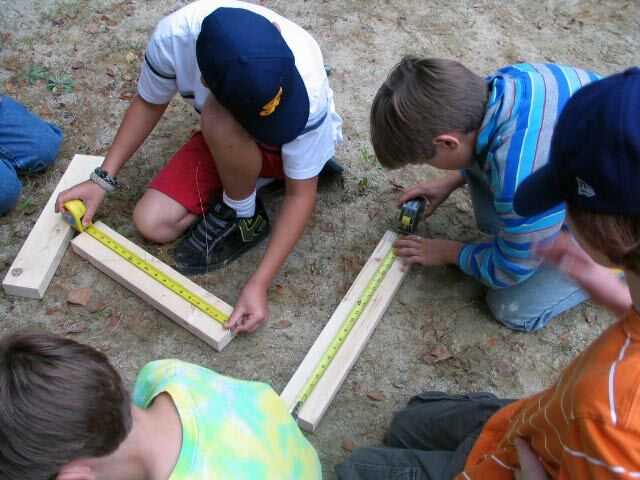 Here, from the Pine Hill Waldorf School, is a perfect example of mathematical communication skills in action: cooperatively measuring lengths of wood for a building project. Mathematically proficient students experiment with representing problem situations in multiple ways including numbers, words (mathematical language), drawing pictures, using objects, acting out, making a chart, list, or graph, creating equations, etc. 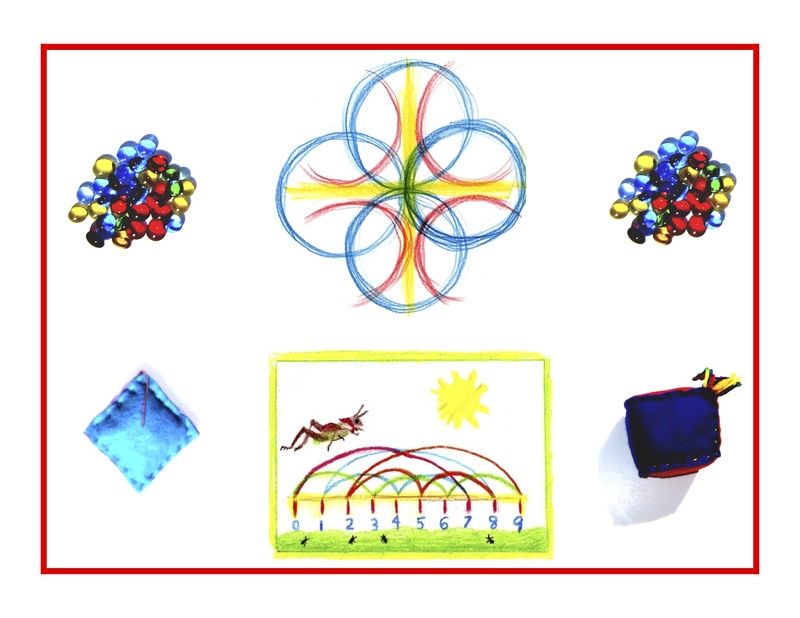 Students require extensive opportunities to generate various mathematical representations and to both equations and story problems, and explain connections between representations as well as between representations and equations. Students should be able to use all of these representations as needed. They should evaluate their results in the context of the situation and reflect on whether the results make sense. Waldorf students experience this sort of broad, varied approach to math from first grade on. Flexibility of thinking is paramount to math success, and it gets off to a flying start as the 4 processes are introduced side by side in first grade. A full spectrum of math expression and experience is employed by teachers and students alike in both the Waldorf and Math By Hand systems. One of the best practical examples of experiencing math principles is Waldorf handwork. For all who practice it regularly, knitting engenders the best of math practice, by casting on and off, counting stitches, and creating geometric patterns. Most importantly, it stimulates neuron health and balance in the right and left brain, while it also enhances eye hand coordination by the repetitive and detailed use of the right and left hands. 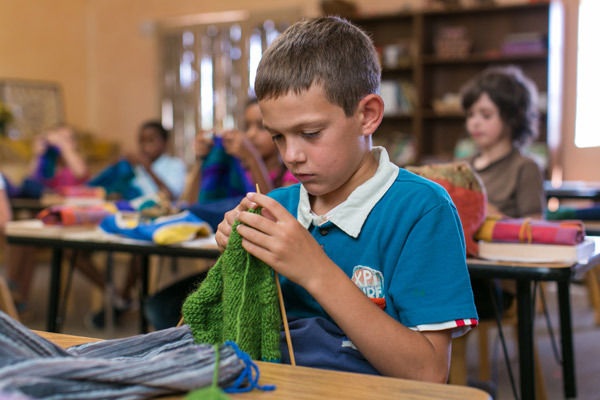 And all children most decidedly thrive on it, as can plainly be seen here, in a knitting class at the Tucson Waldorf School. Knowledge ensues in an environment dedicated to imaginative, creative knowing, where student and teacher alike surrender to the ensuing of knowledge as a worthy goal. Tune in tomorrow for the last of the Grade 3 CCSS math standards and their ambient counterparts.